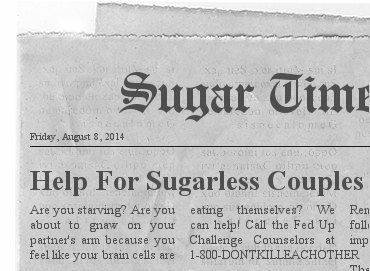 It’s Day 8 of the Fed Up Challenge, a challenge in which it was my own decision not to eat any added sugar for 10 whole dang days. I also decided, without being forced at gunpoint, to not eat any white starches (flour, rice, and potatoes) and now, that I’m 8 days in, I’m wondering what in the heck I was thinking. It’s true that after my rough start, I’ve been feeling pretty good the last 6 days – so much so that I was going on and on about how great I felt and you were probably rolling your eyes. D’ya wanna know how I feel now that it’s Day 8 of the Fed Up Challenge and we’re almost near the end? I’m STARVING. I feel like my stomach is eating its own lining to survive. Maybe it’s because I’ve been too busy to cook today and I’m trying to “make do”. But if I see one more piece of Ezekiel sprouted grain, I’m going to lose my blankety-blankin’ mind. The Hungry Husband is ravenous and crankylicious. I mean, I just don’t know if our marriage can survive without basic necessities, like bread that doesn’t taste like you’re gnawing on plant fibers. Do they have marriage counselors for this? I was so desperate for some normalcy, that I spent the entire afternoon yesterday making pizza from 100% whole grain flour. I read that the dough needs sugar to scientifically rise and most whole wheat crust recipes call for at least some white flour. But like a good girl, I did not add any sugar or white flour to the dough. I was so hungry during this 5-hour cooking disaster wonderful culinary experience , that I thought I was going to pass out. The crust turned out cakey and you could taste the grains. And the icing on the forbidden cake was the fact that I got to choke down this wanna-be pizza with…wait for it…wait for it…water! Oh water. How I love drinking you morning, noon, and night. I so appreciate your lack of flavor, because I would just be so freaking sad if you overpowered the sprouted wheat flavors from my mouth. I’m having a tough day. Oh, did you not know that? When I can eat a meal without label reading, extensive planning, and grains sticking between my teeth, we can talk like we used to…like the good ol’ days. In all seriousness, I’m still glad I took on this challenge. I’ve learned so much about my eating habits and I’ve felt pretty good overall (except today). 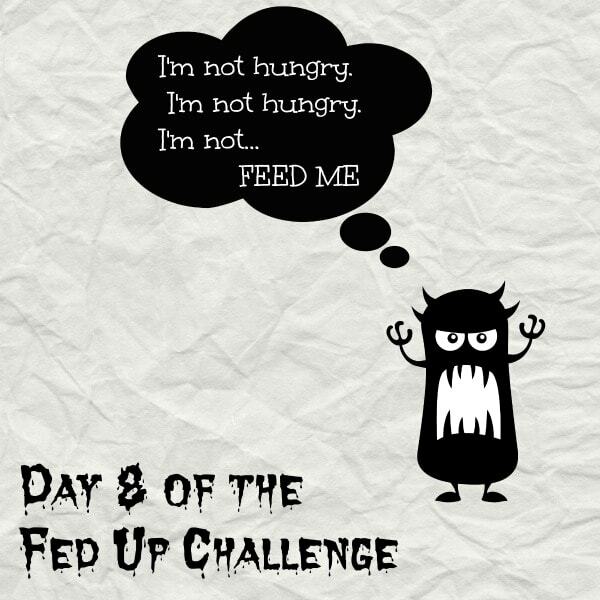 I feel like it’s only day 8 of the Fed Up Challenge and I’m having trouble with the fact that there are 2 days left! Check out my recaps of Day 1, Day 3. and Day 5 of the Fed Up Challenge.